This vegan lemon tart is made with a coconut oil based dough instead of butter and an eggless lemon custard. 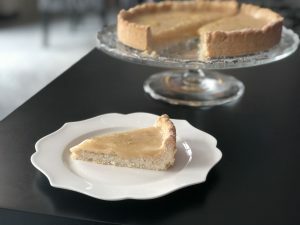 Even if you are not vegan I recommend you try this dessert because it doesn’t require much effort to make and it tastes just as good as a regular lemon tart. I added some desiccated coconut to the crust because I like the extra texture and flavor, but if you don’t like it you can leave it out, just replace it with an extra tablespoon of flour. This is not a very sweet dessert so I recommend you do give it a light dusting of powdered sugar before serving. Line the bottom of a 9 inch springform pan with parchment paper, brush the sides with oil. Set aside. Combine the flour, starch, salt, baking powder, and desiccated coconut; whisk together and set aside. In a small mixing bowl combine the sugar, coconut oil, milk, and citrus zest; whisk these really well until the sugar has dissolved. Add your wet ingredients to the dry mixture and mix with a silicon spatula until a ball of dough forms (it might form into a few large clumps instead of a whole ball). Dump your dough into your prepared pan and press it inside, starting from the middle and working your way up the sides. You should have about 1 inch of dough up the sides. Try to do this as evenly as possible, if you notice that you have a lot of dough in one place and very little in another, just tear a piece and patch it up. Cover the pan with clingfilm and chill for 1 hour or up to 1 day. Preheat oven to 350ºF (180ºC) without fan/ventilation. In a medium saucepan combine all of the ingredients, whisk until smooth and place on medium heat. Whisk the mixture on the stove for 8-10 minutes or until it gets as thick as sour cream. Once it is ready, remove it from the heat. Wrap the bottom of your springform pan with aluminum foil, to avoid any leakage. Place the pan on a baking tray (this will make it easier to transfer it to the oven. Pour your filling inside of the crust and place in the oven. Bake for 45-50 minutes or until the edges of the crust are a golden brown. The filling will still look very wobbly, don’t worry it will set up as it cools. Remove from the oven and allow it to cool completely to room temperature (about 2 hours). Once it has cooled to room temperature, cover the pan with clingfilm and place it in the fridge for at least 4 hours or up to 3 days. Serve with a dusting of powdered sugar.